President Obama, seen here in North Chesterfield, Va., last week, is on a campaign swing through the West this week, making stops in California, Nevada and Colorado — states with significant Hispanic populations. Cain somewhat apologized for the comment, but other GOP presidential candidates have also talked tough: Rep. Michele Bachmann, R-Minn., says she'd build two fences, and former Massachusetts Gov. Mitt Romney and Texas Gov. Rick Perry continue to argue over who's hiring "the illegals." It's rhetoric that drives Latino Republican activists mad. "It's divisive rhetoric and it's frankly ... off-putting language," said Elyse Monroy, who heads Nevada Latinos for Prosperity. Monroy says the harsh talk is making it difficult to recruit new Latino voters. "It is going to be an uphill battle because we are fighting against the rhetoric," she said. "We aren't asking the party to change their policy — we are asking the party to change their tone." DeeDee Garcia Blase of the group Somos Republicans says she too is worried about the rhetoric. "It's hurting us," she said. "It's hurting the Republican image." Garcia Blase says it's hard to get new voters to consider the party when they hear what the candidates say. "They are ruining it," she said. "How the heck do you overcome that?" One way is to change the subject — to the economy. Republican strategist Javier Ortiz says the president is vulnerable with Hispanic voters when it comes to the economy. "It is without question a place where the president has lost the interest and the focus that Hispanics may have had with him in the past," Ortiz said. Recent polls show Obama's once sky-high approval rating has dropped below 50 percent with Hispanic voters. His record on immigration isn't helping, either. His administration has deported record numbers of illegal immigrants from the country, and his promise to pass comprehensive immigration reform never happened. So both parties have their work cut out for them with Hispanic voters. But Arturo Vargas of the National Association of Latino Elected and Appointed Officials, a nonpartisan group, says Republicans have more to worry about. If they want to win the presidency, they have to get more than 35 percent of the Hispanic vote. George W. Bush did it in 2004. Sen. John McCain, R-Ariz., couldn't in 2008. "How they are going to secure that 35 to 40 percent of the Hispanic vote if they are going to continue that kind of rhetoric that we are hearing now on immigration?" Ortiz said. Garcia Blase of Somos Republicans says the candidates can't wait until after the primaries to moderate their tone on immigration. With social networking and the Internet playing a bigger role than just four years ago, she says it won't be as easy as to take back past comments. "In the information age that we are in now, it is going to be hard to retract what has already been said," she said. Then there is always the fear that Hispanic voters may be turned off by both parties — and just sit out the election all together. 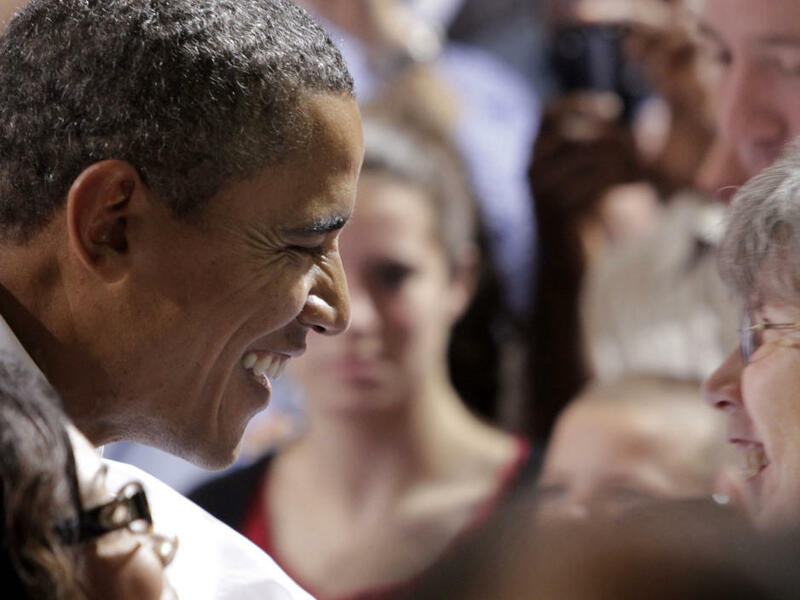 President Obama is on a campaign swing through the West this week. He's making stops in California, Nevada and Ohio. Those are all states where Hispanic voters will play a crucial role in next year's election. Mr. Obama has lost popularity with Latinos recently, mostly due to the economy. And as NPR's Carrie Kahn reports, Hispanic voters looking for alternatives are not too happy with the Republican slate either. CARRIE KAHN, BYLINE: If you've been listening to the GOP Presidential candidates lately, the talk about immigration control is getting rough. Here's candidate Herman Cain on improvements he'd make to the U.S.-Mexico border fence. CAIN: ...with a sign on it on the other side that says it can kill you. KAHN: Cain somewhat apologized for the comment. But Michele Bachman says she'd build two fences. And candidates Mitt Romney and Rick Perry continue to argue over who's hiring, as they say, the illegals. It's rhetoric that drives Latino Republican activists mad. ELYSE MONROY: It's divisive rhetoric and it's off-putting language. KAHN: Elyse Monroy heads a group called Nevada Latinos for Prosperity. She says the harsh talk is making it difficult to recruit new Latino voters. MONROY: It is going to be an uphill battle because we're fighting against the rhetoric, but we're not asking the party to change their policy. We're asking the party to change their tone. KAHN: DeeDee Garcia Blase of the group Somos Republicans is also worried about the rhetoric. DEEDEE GARCIA BLASE: It's hurting us. It's hurting the Republican image. KAHN: Garcia Blase is in Arizona, where the state government has enacted some of the toughest anti-illegal immigration laws in the country. She says it hard to get new voters to consider the party when they hear the candidates being so disrespectful. BLASE: They're ruining it. How in the heck can you overcome that? KAHN: One way is to change the subject to the economy. KAHN: Republican groups ran this ad predominantly in Western states. In it the clearly worried woman says she supported Obama because he spoke so eloquently, but since he's been in office things have gone from bad to worse. Republican strategist Javier Ortiz says the president is vulnerable with Hispanic voters when it comes to the economy. JAVIER ORTIZ: It is without question a place where the president has lost the interest and the focus that Hispanics may have had with him in the past. KAHN: Recent polls show that President Obama's once sky-high approval rating has dropped below fifty percent with Hispanic voters. And his record on immigration isn't helping either. His administration has deported record numbers of illegal immigrants and his promise to pass comprehensive immigration reform never happened. So both parties have their work cut out for them. But Arturo Vargas of NALEO, a non-partisan group of Latino elected officials says Republicans have a bit more to worry about. If they want to win the presidency, they have to get more than 35 percent of the Hispanic vote. George W. Bush did it in 2004. McCain couldn't in 2008. ARTURO VARGAS: How they are going to secure that 35 to 40 percent of the Hispanic vote if they're going to continue the kind of rhetoric that we're hearing now on immigration? KAHN: DeeDee Garcia Blase of Somos Republicans says the candidates can't wait until after the primaries to moderate their tone on immigration. With social networking and the Internet playing a bigger role than just four years ago, Garcia says it won't be as easy as to take back past comments. BLASE: In the information age that we are in now it is going to be hard to retract what has already been said. KAHN: Then there's always the fear that Hispanic voters may be turned off by both parties and just sit out the election all together. SHAPIRO: This is NPR News. Transcript provided by NPR, Copyright NPR.